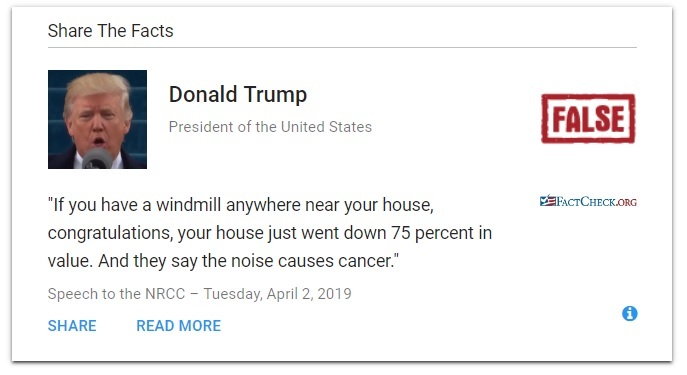 During an April 2 speech to the National Republican Congressional Committee, President Donald Trump once again attacked wind power, falsely claiming that noise from turbines causes cancer and that turbines sink property values by 75 percent. The president has repeatedly erred when it comes to wind power. As we’ve explained before, when the president said living near turbines is noisy enough to make someone “go crazy after a couple of years,” there’s no direct evidence that the sound is harmful to human health. Here, we’ll explain why there’s no turbine-cancer link, and describe some of the economic research about what happens to home prices once wind turbines are constructed. Trump, April 2: Hillary wanted to put up wind. Wind. If you have a windmill anywhere near your house, congratulations, your house just went down 75 percent in value. And they say the noise causes cancer, you tell me that one, okay? There is no evidence that wind turbines cause cancer. The American Cancer Society told us in a statement that it is “unaware of any credible evidence linking the noise from windmills to cancer.” We also searched the biomedical literature for any studies investigating a link, and couldn’t find any. There is also no particular reason to think that wind turbines would cause cancer. Cancer, or what scientists think of as uncontrolled cell growth, is at heart a genetic disease because it starts when a cell has or acquires a mutation in its DNA that allows it to grow unchecked, as the National Cancer Institute explains. Usually many of these failures are needed to form a tumor, which can then become malignant and spread throughout the body. The mutations can be inherited, come about naturally as cells replicate, or can come from environmental exposures, such as cigarette smoke, pollution or ultraviolet light. Typically, these environmental exposures are the things that people are concerned with when they talk about cancer causes. Not all of them directly impact DNA; some can lead cells to divide more quickly, increasing the odds of mutation, as the American Cancer Society says. Sound waves, however, aren’t thought to mutate DNA or to cause cancer in any other way. In fact, some sound waves help diagnose cancer, and they might even fight off the disease, researchers at the Institute of Cancer Research outside London have found. The only plausible way wind turbines might contribute to even a small amount of cancer risk is by increasing stress or disrupting sleep. But it hasn’t yet been demonstrated that those problems do contribute to cancer risk, or that they are caused by turbine noise. Trump’s claim is baseless. As with his cancer claim, Trump’s idea that property values decline by 75 percent when wind turbines go up is also unsubstantiated. This time, the president increased the number by 10 percentage points. But no studies on the issue suggest that property values decline by that much. Many of the strongest and most relevant studies, in fact, indicate small or no changes to property values. A July 2014 paper published in the journal Energy Economics by researchers at the University of Rhode Island, for instance, found “no statistically significant negative impacts on house prices, in either the post public announcement phase or post construction phase.” The study followed more than 48,000 transactions of single-family homes across the state, including more than 3,000 located within a mile of a turbine. Similarly, a large study of more than 120,000 home sales in Massachusetts also found no significant drop in property values due to wind turbines. “The study found no net effects due to the arrival of turbines in the sample’s communities,” the report’s conclusion reads. “Weak evidence suggests that the announcement of the wind facilities had an adverse impact on home prices, but those effects were no longer apparent after turbine construction and eventual operation commenced. 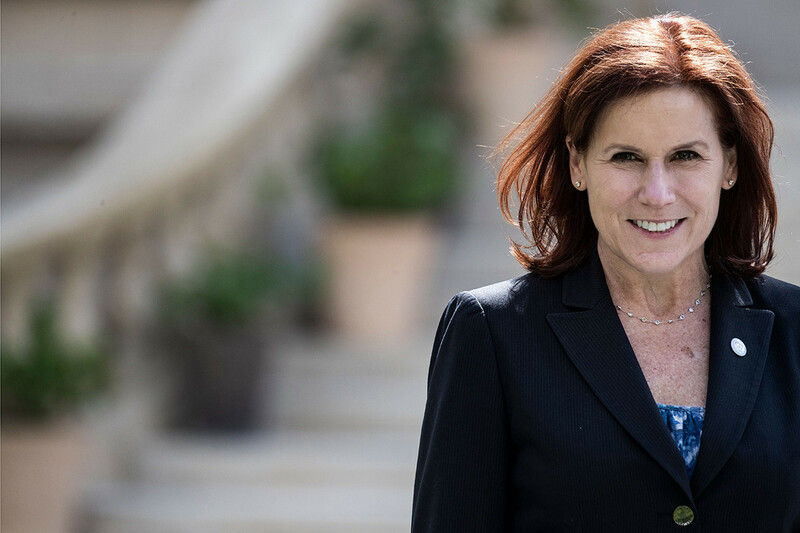 The analysis also showed no unique impact on the rate of home sales near wind turbines.” The study was commissioned by the Massachusetts Clean Energy Center, and performed by researchers at the University of Connecticut and Lawrence Berkeley National Laboratory. One 2012 Clarkson University study of about 11,000 home transactions did identify negative impacts to property values in some parts of upstate New York. Depending on the model the researchers used, their calculations showed property values could fall between 8 and 35 percent if a turbine were installed half a mile from a home. But relatively few homes were that close to turbines. And for one of the three counties studied, the group found that wind turbines generally did not decrease property values. Research from Europe has tended to find more wind turbine impacts on property values. But those studies still aren’t reporting drops as high as 75 percent. A recent working paper produced by the German nonprofit RWI Essen found that house values fell by an average of 7.1 percent if turbines were within 1 kilometer, or 0.6 miles, of a home. The hits were highest for older houses built before 1949, which saw up to a 23 percent decline in property value. Other studies from Europe suggest similar or less severe drops in property values. One 2015 report from the London School of Economics, for example, found average price reductions of 5 to 6 percent when U.K. homes were within 2 kilometers, or 1.2 miles, of a wind farm. Large wind farms, however, could take off up to 12 percent of home values within the same distance. In contrast, a 2016 Dutch study identified just a 1.4 percent drop in property values when turbines were located within 2 kilometers. While individual owners may have unique experiences, there is nothing to corroborate Trump’s claim that wind turbines regularly result in property value drops of 75 percent. In his remarks, Trump also complained about wind turbines killing birds and falsely said that shooting a bald eagle in California can land someone in jail for five years. Trump, April 2: And of course it’s like a graveyard for birds. If you love birds, you’d never want to walk under a windmill because it’s a very sad, sad sight. It’s like a cemetery. We put a little statue for the poor birds. It’s true. You know in California if you shoot a bald eagle, they put you in jail for five years. And yet the windmills, they wipe them all out. It’s true. They wipe them out. It’s terrible. As we’ve addressed previously, the maximum penalty for shooting a bald eagle is a fine or two years in prison, which only applies for a second or felony-level conviction. Most people do not serve jail time. Turbines do kill birds. The U.S. Fish & Wildlife Service estimates that 140,438 to 327,586 birds die every year from collisions with turbines. But turbines do relatively little damage compared with other sources. More than a billion birds are lost to cats every year, and millions more to vehicles, electric lines and buildings. Trump also repeated a fanciful story of a woman wanting to watch television, but not being able to because the wind wasn’t blowing — a tale he also relayed during his Conservative Political Action Conference speech on March 2. But people do not lose their electricity when the wind doesn’t blow. The energy generated by wind turbines feeds into the electrical grid, which, as we’ve explained before, is almost always able to handle the intermittent nature of wind power or any other power source. Có nghĩa là theo ngài “bác sĩ” tổng thống thì âm thanh sẽ gây ra ung thư héng. Giống như mấy tháng trước, khi vùng Đông Bắc Hoa Kỳ bị bão tuyết, ngài Giáo Chủ nhà ta chui vô chuồng chim lập đàn “hô phong hoán vũ” để gọi “global warming” về giúp vậy mà (tui nói đây là chuyện có thật nhá chàng tín đồ của Trump. Tui không đặt điều, dựng chuyện đâu!). of some of the Trump administration’s most contentious policies, has resigned. Nielsen will be leaving her position, and I would like to thank her for her service. Gần mực thì thâm gần Trâm thì bị từ chức. Theo Trâm làm mẹ mìn bắt cóc con nít nhốt vô chuồng cũng hông sướng gì mấy. Còn nữa, còn thêm vài “người tình bỏ ta đi” nữa. Chưa hết đâu! Senior GOP Senator Chuck Grassley warned Trump not to oust any more top immigration officials. Links, bấm vô đây “New York Times” & “Washington Post” để đọc thêm. Tui nhớ hồi nhỏ lúc còn học tiểu học ở SG, có ông kia đẩy cái xe thùng chiếu phim câm “Sạc Lô” trước cổng trường. Mấy đứa con nít tụi tui mỗi lần muốn coi phim là phải trả tiền lẻ cho ổng, rồi khòm khòm xung quanh xe, kê mắt vô những lổ (như ống dòm) để coi phim. __ Những clips YouTube sau đây người không hiểu Tiếng Anh xem, vẫn có thể hiểu như phim câm Sạc-Lô vậy. Bà con để ý (ở phút 1:06) xem thằng con nít 72 tuổi đẩy người khác ra để giành đứng phía trước chụp hình nhá! ___ In frontotemporal dementia portions of these lobes shrink (atrophy) <= Theo loại chữ trên lưng Trường Sơn thì chúng gọi là “bệnh teo não” đấy bác nó!